Free Video Violin Lesson 8 | Free Violin Lessons at Stringsavvy.com! 1. What is U.H, L.H. and W.B.? Can you demonstrate them comfortably? 2. What is the proper way to play shoulder pizzicato? 3. From this point on I will assume you have learned all of your notes on the D and A string. If you haven’t, then you should probably go back and spend more time with the earlier lessons. How did you do with Tribal Lament? Watch and compare your playing to mine. Hello and welcome to Stringsavvy.com Violin Lesson #8! In lesson #7 we learned about playing using different parts of our bow while adding fingered notes back into the mix. Today we are going to learn how to count Eighth Notes! This allowed us to keep a steady beat, similar to hopping between jumps while skipping rope. 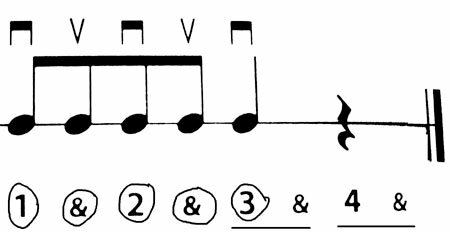 This act of splitting up a beat is called subdivision. 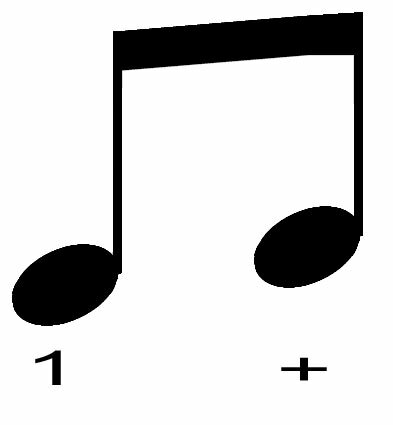 When we count Eighth Notes, each note begins both on both then number as well as the & (and). For each of these we refer to them as “The and of #.” For example if we wanted to refer to the “&” immediately after beat one, we would call it, “the & of 1.” Easy enough, right? Now we combine the counting of Eight Notes and Quarter Notes! To make it easier, we are going to circle on the count whenever our bow moves. 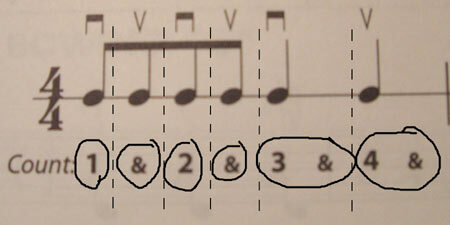 Make sure you don’t circle beat 4 of the 4th measure. Can you guess why? Another way of counting is using what is called the Addition System. 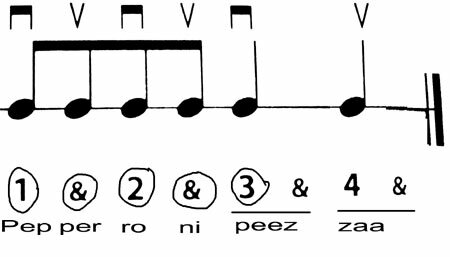 Instead of counting a Quarter Note as ONE AND, we count as WUH – UHN. This will help us associate in our head the idea of the length of a quarter note. 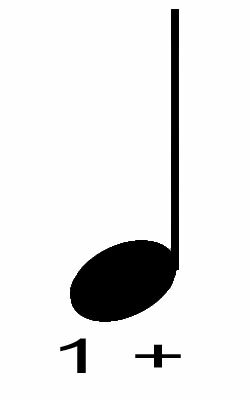 The Eighth Note we will leave as is because those are to be played as two separate notes. Whenever you have a REST, just whisper the count for that beat. Try this new counting with #70! Turn the page and look at #82. You will notice that there is a “4+” written on TOP of the notes. This means to use your 4th finger (pinky) from your left hand to pluck the open string while the violin is on your shoulder. Be sure to keep a rounded finger while doing this. If you don’t already have a metronome, now might be a good time to pick one up! Subdivide – splitting up a beat to better understand its length or count. Be careful counting! Take a slow enough tempo so you can do this correctly! With your pinky (4th finger). Keep it rounded! Hey Brandon! I’m glad you find the lessons helpful! I’m not sure where you could find links to bluegrass music, and I’m not too well versed in it myself. My background is much more classical and jazz. However, I do strongly believe that in many of the folk styles (jazz, bluegrass, fiddle, etc) much of learning comes from immersing yourself in the music, trying to play along with recordings, and learning the style by ear. Have fun and keep making music! More lessons are on the way! 1- we change the bow direction to get the 8notes,(up-down-up-dow) if we are playing the same note, but if the notes are D-E-F-G we just use a down bow for all? One of the cool things (and sometimes messes us up) is that the articulation can be marked by the fingers, bow, or both. In this case you should use a separate bow for each note. There isn’t always concrete rule to the amount of bow to use per note, as it is determined by the length, volume, tempo, technique, articulation, etc. For faster notes you WILL tend use shorter bow strokes, simply to allow for time. So yes, it can get confusing doing two different things, especially when you are used to a different instrument! For where we are now, the bow and the fingers will both move at the same time. This will change when we begin to add slurs. Sorry for the delay on Lesson 9- school has been crazy, new videos will be up soon! I do not know any violinists with hearing problems, but that could simply be because none of them had the determination to strive forward! I know a large part of violin playing comes from being able to hear pitches to set intonation, however, I’m sure with the help of your hearing aid and perhaps some bone conduction you will be able to pick up pitches. I have full confidence and believe anything is possible. In Think and Grow Rich, Napoleon Hill writes that his son was born without ears. However, Hill encouraged his son and taught him that he could achieve anything. His child grew up to be top of his college class and end up very successful as a spokesman for some of the very first hearing aids. I wish you the best of luck, and I hope you will keep me updated on your progress, as I’m sure other users on this site would be excited see you move along! I have been meaning to write an article on a particular video by deaf percussionist Evelyn Glennie, but perhaps you could offer some of your own personal insight as you journey into music. That link is the video plus a full transcript. My name is Shang from Malaysia, and first of all thank you for creating these clips (lessons) as I am new to violin and I am glad to learn lots of things from your sites good job by the way. The only thing which keep bothering me throughout the lessons is the tune of the violin, I am having a bad time tuning my violin as i am still not use to the way of proper tuning, as a result of that, I broke my strings 3 times in a month -.-| and still counting perhaps ….=_=|||. so i just have a small request from you Thom, that is it possible to have a *bonus* clips on tuning the violin in near future? thank you. I am so glad to hear from people all over the world! Thank you for those links! I added them to the links on the right-hand navigation! Hopefully after the video you won’t have any more broken strings! Don’t worry with your video, I’m not expecting perfection. I just want to help you determine whats going on with your bow, and hopefully with your permission, use it on the site.